Our jewelry craftsman discovered a series of jewelry making tools and hubs from centuries' past spanning the late 1700s to the early 1900s. These were the original materials that jewelry craftsman of the time used to create their rings. Our Edwardian-Style Paisley wedding band is from this authentic vintage series. Although the jewelry hubs were not dated, this particular band appears to be from the late 19th or early 20th century, placing its design most likely somewhere within the Victorian or Edwardian era. Our designers, today, use these original hubs to recreate an exact jewelry replica from the period as a brand new ring. In other words, these are not simple redesigns from the imagination of a ring designer, but made from the original wedding band of the period in 14k white gold. Paisley band measures 3.4mm wide. Also available in 14k yellow or rose gold gold, 18k, or platinum (by request), or sterling silver (shown below). 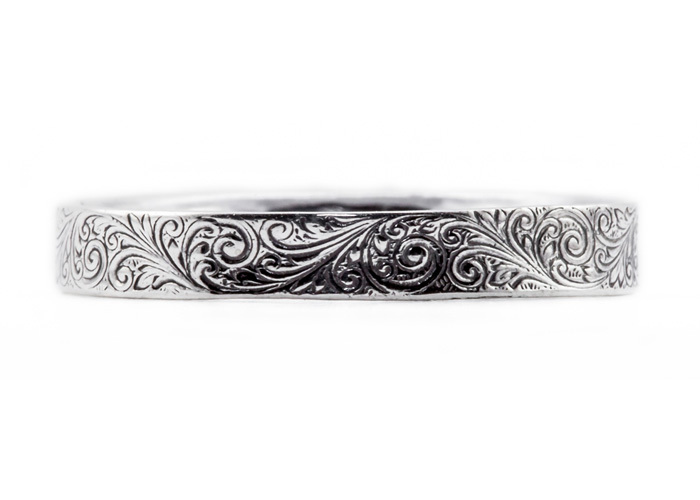 We guarantee our Edwardian-Style Paisley Wedding Band Ring in 14K White Gold to be high quality, authentic jewelry, as described above.